The act of performing surgery may be called a "surgical procedure", "operation", or simply "surgery". In this context, the verb "operate" means to perform surgery. The adjective "surgical" means pertaining to surgery; e.g. surgical instruments or surgical nurse. The patient or subject on which the surgery is performed can be a person or an animal. A surgeon is a person who practices surgery and a surgeon's assistant is a person who practices surgical assistance. A surgical team is made up of surgeon, surgeon's assistant, anaesthesia provider, circulating nurse and surgical technologist. Surgery usually spans minutes to hours, but it is typically not an ongoing or periodic type of treatment. The term "surgery" can also refer to the place where surgery is performed, or, in British English, simply the office of a physician, dentist, or veterinarian. Surgery is a technology consisting of a physical intervention on tissues. Surgical procedures are commonly categorized by urgency, type of procedure, body system involved, the degree of invasiveness, and special instrumentation. Based on timing: Elective surgery is done to correct a non-life-threatening condition, and is carried out at the patient's request, subject to the surgeon's and the surgical facility's availability. A semi-elective surgery is one that must be done to avoid permanent disability or death, but can be postponed for a short time. Emergency surgery is surgery which must be done promptly to save life, limb, or functional capacity. Based on purpose: Exploratory surgery is performed to aid or confirm a diagnosis. Therapeutic surgery treats a previously diagnosed condition. Cosmetic surgery is done to subjectively improve the appearance of an otherwise normal structure. By type of procedure: Amputation involves cutting off a body part, usually a limb or digit; castration is also an example. Resection is the removal of all of an internal organ or body part, or a key part (lung lobe; liver quadrant) of such an organ or body part that has its own name or code designation. Excision is the cutting out or removal of only part of an organ, tissue, or other body part from the patient. Replantation involves reattaching a severed body part. Reconstructive surgery involves reconstruction of an injured, mutilated, or deformed part of the body. Transplant surgery is the replacement of an organ or body part by insertion of another from different human (or animal) into the patient. 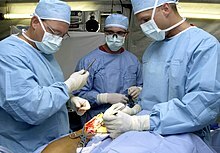 Removing an organ or body part from a live human or animal for use in transplant is also a type of surgery. By body part: When surgery is performed on one organ system or structure, it may be classed by the organ, organ system or tissue involved. Examples include cardiac surgery (performed on the heart), gastrointestinal surgery (performed within the digestive tract and its accessory organs), and orthopedic surgery (performed on bones or muscles). By equipment used: Laser surgery involves use of a laser for cutting tissue instead of a scalpel or similar surgical instruments. Microsurgery involves the use of an operating microscope for the surgeon to see small structures. Robotic surgery makes use of a surgical robot, such as the Da Vinci or the ZEUS robotic surgical systems , to control the instrumentation under the direction of the surgeon. Minimally invasive procedures, involving small incisions through which an endoscope is inserted, end in -oscopy. For example, such surgery in the abdominal cavity is called laparoscopy. Reoperation (return to the operating room) refers to a return to the operating theater after an initial surgery is performed to re-address an aspect of patient care best treated surgically. Reasons for reoperation include persistent bleeding after surgery, development of or persistence of infection. Inpatient surgery is performed in a hospital, and the patient stays at least one night in the hospital after the surgery. Outpatient surgery occurs in a hospital outpatient department or freestanding ambulatory surgery center, and the patient is discharged the same working day. Office surgery occurs in a physician's office, and the patient is discharged the same working day. At a hospital, modern surgery is often performed in an operating theater using surgical instruments, an operating table for the patient, and other equipment. Among United States hospitalizations for nonmaternal and nonneonatal conditions in 2012, more than one-fourth of stays and half of hospital costs involved stays that included operating room (OR) procedures. The environment and procedures used in surgery are governed by the principles of aseptic technique: the strict separation of "sterile" (free of microorganisms) things from "unsterile" or "contaminated" things. All surgical instruments must be sterilized, and an instrument must be replaced or re-sterilized if, it becomes contaminated (i.e. handled in an unsterile manner, or allowed to touch an unsterile surface). Operating room staff must wear sterile attire (scrubs, a scrub cap, a sterile surgical gown, sterile latex or non-latex polymer gloves and a surgical mask), and they must scrub hands and arms with an approved disinfectant agent before each procedure. In the pre-operative holding area, the patient changes out of his or her street clothes and is asked to confirm the details of his or her surgery. A set of vital signs are recorded, a peripheral IV line is placed, and pre-operative medications (antibiotics, sedatives, etc.) are given. When the patient enters the operating room, the skin surface to be operated on, called the operating field, is cleaned and prepared by applying an antiseptic such as chlorhexidine gluconate or povidone-iodine to reduce the possibility of infection. If hair is present at the surgical site, it is clipped off prior to prep application. The patient is assisted by an anesthesiologist or resident to make a specific surgical position, then sterile drapes are used to cover the surgical site or at least a wide area surrounding the operating field; the drapes are clipped to a pair of poles near the head of the bed to form an "ether screen", which separates the anesthetist/anesthesiologist's working area (unsterile) from the surgical site (sterile). Anesthesia is administered to prevent pain from an incision, tissue manipulation and suturing. Based on the procedure, anesthesia may be provided locally or as general anesthesia. Spinal anesthesia may be used when the surgical site is too large or deep for a local block, but general anesthesia may not be desirable. With local and spinal anesthesia, the surgical site is anesthetized, but the patient can remain conscious or minimally sedated. In contrast, general anesthesia renders the patient unconscious and paralyzed during surgery. The patient is intubated and is placed on a mechanical ventilator, and anesthesia is produced by a combination of injected and inhaled agents. Choice of surgical method and anesthetic technique aims to reduce the risk of complications, shorten the time needed for recovery and minimise the surgical stress response. An incision is made to access the surgical site. Blood vessels may be clamped or cauterized to prevent bleeding, and retractors may be used to expose the site or keep the incision open. The approach to the surgical site may involve several layers of incision and dissection, as in abdominal surgery, where the incision must traverse skin, subcutaneous tissue, three layers of muscle and then the peritoneum. In certain cases, bone may be cut to further access the interior of the body; for example, cutting the skull for brain surgery or cutting the sternum for thoracic (chest) surgery to open up the rib cage. Whilst in surgery aseptic technique is used to prevent infection or further spreading of the disease. The surgeons' and assistants' hands, wrists and forearms are washed thoroughly for at least 4 minutes to prevent germs getting into the operative field, then sterile gloves are placed onto their hands. An antiseptic solution is applied to the area of the patient's body that will be operated on. Sterile drapes are placed around the operative site. Surgical masks are worn by the surgical team to avoid germs on droplets of liquid from their mouths and noses from contaminating the operative site. Reduction – the movement or realignment of a body part to its normal position. e.g. Reduction of a broken nose involves the physical manipulation of the bone or cartilage from their displaced state back to their original position to restore normal airflow and aesthetics. insertion of prosthetic parts when needed. Pins or screws to set and hold bones may be used. Sections of bone may be replaced with prosthetic rods or other parts. Sometimes a plate is inserted to replace a damaged area of skull. Artificial hip replacement has become more common. Heart pacemakers or valves may be inserted. Many other types of prostheses are used. Blood or blood expanders may be administered to compensate for blood lost during surgery. Once the procedure is complete, sutures or staples are used to close the incision. Once the incision is closed, the anesthetic agents are stopped or reversed, and the patient is taken off ventilation and extubated (if general anesthesia was administered). After completion of surgery, the patient is transferred to the post anesthesia care unit and closely monitored. When the patient is judged to have recovered from the anesthesia, he/she is either transferred to a surgical ward elsewhere in the hospital or discharged home. During the post-operative period, the patient's general function is assessed, the outcome of the procedure is assessed, and the surgical site is checked for signs of infection. There are several risk factors associated with postoperative complications, such as immune deficiency and obesity. Obesity has long been considered a risk factor for adverse post-surgical outcomes. It has been linked to many disorders such as obesity hypoventilation syndrome, atelectasis and pulmonary embolism, adverse cardiovascular effects, and wound healing complications. If removable skin closures are used, they are removed after 7 to 10 days post-operatively, or after healing of the incision is well under way. It is not uncommon for surgical drains (see Drain (surgery)) to be required to remove blood or fluid from the surgical wound during recovery. Mostly these drains stay in until the volume tapers off, then they are removed. These drains can become clogged, leading to abscess. The use of topical antibiotics on surgical wounds to reduce infection rates has been questioned. Antibiotic ointments are likely to irritate the skin, slow healing, and could increase risk of developing contact dermatitis and antibiotic resistance. It has also been suggested that topical antibiotics should only be used when a person shows signs of infection and not as a preventative. A systematic review published by Cochrane (organisation) in 2016, though, concluded that topical antibiotics applied over certain types of surgical wounds reduce the risk of surgical site infections, when compared to no treatment or use of antiseptics. The review also did not find conclusive evidence to suggest that topical antibiotics increased the risk of local skin reactions or antibiotic resistance. While pain is universal and expected after surgery, there is growing evidence that pain may be inadequately treated in many patients in the acute period after surgery. It has been reported that incidence of inadequately controlled pain after surgery ranged from 25.1% to 78.4% across all surgical disciplines. In 2011, of the 38.6 million hospital stays in U.S. hospitals, 29% included at least one operating room procedure. These stays accounted for 48% of the total $387 billion in hospital costs. The overall number of procedures remained stable from 2001 to 2011. In 2011, over 15 million operating room procedures were performed in U.S. hospitals. Data from 2003 to 2011 showed that U.S. hospital costs were highest for the surgical service line; the surgical service line costs were $17,600 in 2003 and projected to be $22,500 in 2013. For hospital stays in 2012 in the United States, private insurance had the highest percentage of surgical expenditure. in 2012, mean hospital costs in the United States were highest for surgical stays. Doctors perform surgery with the consent of the patient. Some patients are able to give better informed consent than others. Populations such as incarcerated persons, people living with dementia, the mentally incompetent, persons subject to coercion, and other people who are not able to make decisions with the same authority as a typical patient have special needs when making decisions about their personal healthcare, including surgery. Five billion people worldwide lack access to safe, timely, and affordable surgical and anesthesia care. Areas in which especially large proportions of the population lack access include Sub-Saharan Africa, the Indian Subcontinent, Central Asia and, to a lesser extent, Russia and China. Of the estimated 312.9 million surgical procedures undertaken worldwide in 2012, only 6.3% were done in countries comprising the poorest 37.3% of the world's population. Globally, 4.2 million people are estimated to die within 30 days of surgery each year, with half of these occurring in low- and middle-income countries. A prospective study of 10,745 adult patients undergoing emergency abdominal surgery from 357 centres across 58 countries found that mortality is three times higher in low- compared with high-human development index (HDI) countries even when adjusted for prognostic factors. In this study the overall global mortality rate was 1·6 per cent at 24 hours (high HDI 1·1 per cent, middle HDI 1·9 per cent, low HDI 3·4 per cent), increasing to 5·4 per cent by 30 days (high HDI 4·5 per cent, middle HDI 6·0 per cent, low HDI 8·6 per cent; P < 0·001). A sub-study of 1,409 children undergoing emergency abdominal surgery from 253 centres across 43 countries found that adjusted mortality in children following surgery may be as high as 7 times greater in low-HDI and middle-HDI countries compared with high-HDI countries. This translate to 40 excess deaths per 1000 procedures performed in these settings. Patient safety factors were suggested to play an important role, with use of the WHO Surgical Safety Checklist associated with reduced mortality at 30 days. Access to surgical care is increasingly recognized as an integral aspect of healthcare, and therefore is evolving into a normative derivation of human right to health. The ICESCR Article 12.1 and 12.2 define the human right to health as "the right of everyone to the enjoyment of the highest attainable standard of physical and mental health" In the August 2000, the UN Committee on Economic, Social and Cultural Rights (CESCR) interpreted this to mean "right to the enjoyment of a variety of facilities, goods, services, and conditions necessary for the realization of the highest attainable health". Surgical care can be thereby viewed as a positive right – an entitlement to protective healthcare. Woven through the International Human and Health Rights literature is the right to be free from surgical disease. The 1966 ICESCR Article 12.2a described the need for "provision for the reduction of the stillbirth-rate and of infant mortality and for the healthy development of the child" which was subsequently interpreted to mean “requiring measures to improve… emergency obstetric services”. Article 12.2d of the ICESCR stipulates the need for “the creation of conditions which would assure to all medical service and medical attention in the event of sickness”, and is interpreted in the 2000 comment to include timely access to “basic preventative, curative services… for appropriate treatment of injury and disability.". Obstetric care shares close ties with reproductive rights, which includes access to reproductive health. Surgeons and public health advocates, such as Kelly McQueen, have described surgery as "Integral to the right to health". This is reflected in the establishment of the WHO Global Initiative for Emergency and Essential Surgical Care in 2005, the 2013 formation of the Lancet Commission for Global Surgery, the 2015 World Bank Publication of Volume 1 of its Disease Control Priorities "Essential Surgery", and the 2015 World Health Assembly 68.15 passing of the Resolution for Strengthening Emergency and Essential Surgical Care and Anesthesia as a Component of Universal Health Coverage. The Lancet Commission for Global Surgery outlined the need for access to "available, affordable, timely and safe" surgical and anesthesia care; dimensions paralleled in ICESCR General Comment No. 14, which similarly outlines need for available, accessible, affordable and timely healthcare. Surgical treatments date back to the prehistoric era. The oldest for which there is evidence is trepanation, in which a hole is drilled or scraped into the skull, thus exposing the dura mater in order to treat health problems related to intracranial pressure and other diseases. Prehistoric surgical techniques are seen in Ancient Egypt, where a mandible dated to approximately 2650 BC shows two perforations just below the root of the first molar, indicating the draining of an abscessed tooth. Surgical texts from ancient Egypt date back about 3500 years ago. Surgical operations were performed by priests, specialized in medical treatments similar to today, and used sutures to close wounds. Infections were treated with honey. Remains from the early Harappan periods of the Indus Valley Civilization (c. 3300 BC) show evidence of teeth having been drilled dating back 9,000 years. 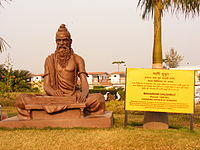 Susruta was an ancient Indian surgeon commonly credited as the author of the treatise Sushruta Samhita. He is dubbed as the "founding father of surgery" and his period is usually placed between the period of 1200–600 BC. One of the earliest known mention of the name is from the Bower Manuscript where Sushruta is listed as one of the ten sages residing in the Himalayas. Texts also suggest that he learned surgery at Kasi from Lord Dhanvantari, the god of medicine in Hindu mythology. It is one of the oldest known surgical texts and it describes in detail the examination, diagnosis, treatment, and prognosis of numerous ailments, as well as procedures on performing various forms of cosmetic surgery, plastic surgery and rhinoplasty. In ancient Greece, temples dedicated to the healer-god Asclepius, known as Asclepieia (Greek: Ασκληπιεία, sing. Asclepieion Ασκληπιείον), functioned as centers of medical advice, prognosis, and healing. In the Asclepieion of Epidaurus, some of the surgical cures listed, such as the opening of an abdominal abscess or the removal of traumatic foreign material, are realistic enough to have taken place. The Greek Galen was one of the greatest surgeons of the ancient world and performed many audacious operations – including brain and eye surgery – that were not tried again for almost two millennia. Surgery was developed to a high degree in the Islamic world. Abulcasis (Abu al-Qasim Khalaf ibn al-Abbas Al-Zahrawi), an Andalusian-Arab physician and scientist who practiced in the Zahra suburb of Córdoba. His works on surgery, largely based upon Paul of Aegina's Pragmateia, were influential. Al-Zahrawi specialized in curing disease by cauterization. He invented several surgical instruments, for purposes such as inspection of the interior of the urethra and for removing foreign bodies from the throat, the ear, and other body organs. He was also the first to illustrate the various cannulae and the first to treat a wartwith an iron tube and caustic metal as a boring instrument.Al-Zahrawi also pioneeredneurosurgery and neurological diagnosis. He is known to have performed surgical treatments of head injuries, skull fractures, spinal injuries, hydrocephalus, subdural effusions and headache. The first clinical description of an operative procedure for hydrocephalus was given by Al-Zahrawi who clearly describes the evacuation of superficial intracranial fluid in hydrocephalic children. In Europe, the demand grew for surgeons to formally study for many years before practicing; universities such as Montpellier, Padua and Bologna were particularly renowned. In the 12th century, Rogerius Salernitanus composed his Chirurgia, laying the foundation for modern Western surgical manuals. Barber-surgeons generally had a bad reputation that was not to improve until the development of academic surgery as a specialty of medicine, rather than an accessory field. Basic surgical principles for asepsis etc., are known as Halsteads principles. There were some important advances to the art of surgery during this period. The professor of anatomy at the University of Padua, Andreas Vesalius, was a pivotal figure in the Renaissance transition from classical medicine and anatomy based on the works of Galen, to an empirical approach of 'hands-on' dissection. In his anatomic treatis De humani corporis fabrica, he exposed the many anatomical errors in Galen and advocated that all surgeons should train by engaging in practical dissections themselves. The discipline of surgery was put on a sound, scientific footing during the Age of Enlightenment in Europe. An important figure in this regard was the Scottish surgical scientist, John Hunter, generally regarded as the father of modern scientific surgery. He brought an empirical and experimental approach to the science and was renowned around Europe for the quality of his research and his written works. Hunter reconstructed surgical knowledge from scratch; refusing to rely on the testimonies of others, he conducted his own surgical experiments to determine the truth of the matter. To aid comparative analysis, he built up a collection of over 13,000 specimens of separate organ systems, from the simplest plants and animals to humans. Modern pain control through anesthesia was discovered in the mid-19th century. Before the advent of anesthesia, surgery was a traumatically painful procedure and surgeons were encouraged to be as swift as possible to minimize patient suffering. This also meant that operations were largely restricted to amputations and external growth removals. Beginning in the 1840s, surgery began to change dramatically in character with the discovery of effective and practical anaesthetic chemicals such as ether, first used by the American surgeon Crawford Long, and chloroform, discovered by Scottish obstetrician James Young Simpson and later pioneered by John Snow, physician to Queen Victoria. In addition to relieving patient suffering, anaesthesia allowed more intricate operations in the internal regions of the human body. In addition, the discovery of muscle relaxants such as curare allowed for safer applications. Unfortunately, the introduction of anesthetics encouraged more surgery, which inadvertently caused more dangerous patient post-operative infections. The concept of infection was unknown until relatively modern times. The first progress in combating infection was made in 1847 by the Hungarian doctor Ignaz Semmelweis who noticed that medical students fresh from the dissecting room were causing excess maternal death compared to midwives. Semmelweis, despite ridicule and opposition, introduced compulsory handwashing for everyone entering the maternal wards and was rewarded with a plunge in maternal and fetal deaths; however, the Royal Society dismissed his advice. Until the pioneering work of British surgeon Joseph Lister in the 1860s, most medical men believed that chemical damage from exposures to bad air (see "miasma") was responsible for infections in wounds, and facilities for washing hands or a patient's wounds were not available. Lister became aware of the work of French chemist Louis Pasteur, who showed that rotting and fermentation could occur under anaerobic conditions if micro-organisms were present. Pasteur suggested three methods to eliminate the micro-organisms responsible for gangrene: filtration, exposure to heat, or exposure to chemical solutions. Lister confirmed Pasteur's conclusions with his own experiments and decided to use his findings to develop antiseptic techniques for wounds. As the first two methods suggested by Pasteur were inappropriate for the treatment of human tissue, Lister experimented with the third, spraying carbolic acid on his instruments. He found that this remarkably reduced the incidence of gangrene and he published his results in The Lancet. Later, on 9 August 1867, he read a paper before the British Medical Association in Dublin, on the Antiseptic Principle of the Practice of Surgery, which was reprinted in The British Medical Journal. His work was groundbreaking and laid the foundations for a rapid advance in infection control that saw modern antiseptic operating theatres widely used within 50 years. ^ From the Greek: χειρουργική cheirourgikē (composed of χείρ, "hand", and ἔργον, "work"), via Latin: chirurgiae, meaning "hand work". ^ "Doctor's surgery". Collins English Dictionary. Archived from the original on 10 February 2018. Retrieved 10 February 2018. ^ Lemos P, Jarrett P, Philip B, eds. (2006). Day surgery: development and practice (PDF). London: International Association for Ambulatory Surgery. ISBN 978-989-20-0234-7. ^ Twersky RS, Philip BK, eds. (2008). Handbook of ambulatory anesthesia (2nd ed.). New York: Springer. p. 284. ISBN 978-0-387-73328-9. ^ Fingar KR, Stocks C, Weiss AJ, Steiner CA (December 2014). "Most Frequent Operating Room Procedures Performed in U.S. Hospitals, 2003–2012". HCUP Statistical Brief No. 186. Rockville, MD: Agency for Healthcare Research and Quality. Archived from the original on 3 May 2015. "American College of Radiology ACR Appropriateness Criteria". American College of Radiology. 2000. Archived from the original on 10 February 2013. Retrieved 4 September 2012. Last reviewed 2011. Gómez-Gil, E.; Trilla, A.; Corbella, B.; Fernández-Egea, E.; Luburich, P.; De Pablo, J.; Ferrer Raldúa, J.; Valdés, M. (2002). "Lack of clinical relevance of routine chest radiography in acute psychiatric admissions". General Hospital Psychiatry. 24 (2): 110–13. doi:10.1016/s0163-8343(01)00179-7. PMID 11869746. Archer, C.; Levy, A.R. ; McGregor, M. (1993). "Value of routine preoperative chest x-rays: A meta-analysis". Canadian Journal of Anesthesia. 40 (11): 1022–27. doi:10.1007/BF03009471. PMID 8269561. Munro, J.; Booth, A.; Nicholl, J. (1997). "Routine preoperative testing: A systematic review of the evidence". Health Technology Assessment (Winchester, England). 1 (12): i–iv, 1–62. PMID 9483155. Grier, D.J. ; Watson, L.J. ; Hartnell, G.G. ; Wilde, P. (1993). "Are routine chest radiographs prior to angiography of any value?". Clinical Radiology. 48 (2): 131–33. doi:10.1016/S0009-9260(05)81088-8. PMID 8004892. Gupta, S.D. ; Gibbins, F.J.; Sen, I. (1985). "Routine chest radiography in the elderly". Age and Ageing. 14 (1): 11–14. doi:10.1093/ageing/14.1.11. PMID 4003172. Amorosa JK; Bramwit MP; Mohammed TL; Reddy GP; et al. "ACR Appropriateness Criteria routine chest radiographs in ICU patients". National Guideline Clearinghouse. Archived from the original on 15 September 2012. Retrieved 4 September 2012. Keay, L.; Lindsley, K.; Tielsch, J.; Katz, J.; Schein, O. (2012). Keay, Lisa (ed.). "Routine preoperative medical testing for cataract surgery". The Cochrane Library (2): CD007293. doi:10.1002/14651858.CD007293.pub3. PMC 4261928. PMID 22419323. Katz, R.I.; Dexter, F.; Rosenfeld, K.; Wolfe, L.; Redmond, V.; Agarwal, D.; Salik, I.; Goldsteen, K.; Goodman, M.; Glass, P.S.A. (2011). "Survey Study of Anesthesiologistsʼ and Surgeonsʼ Ordering of Unnecessary Preoperative Laboratory Tests". Anesthesia & Analgesia. 112 (1): 207–12. doi:10.1213/ANE.0b013e31820034f0. PMID 21081771. Reynolds, T.M. ; National Institute for Health Clinical Excellence; Clinical Science Reviews Committee of the Association for Clinical Biochemistry (2006). "National Institute for Health and Clinical Excellence guidelines on preoperative tests: The use of routine preoperative tests for elective surgery". Annals of Clinical Biochemistry. 43 (Pt 1): 13–16. doi:10.1258/000456306775141623. PMID 16390604. Capdenat Saint-Martin, E.; Michel, P.; Raymond, J.M. ; Iskandar, H.; Chevalier, C.; Petitpierre, M.N. ; Daubech, L.; Amouretti, M.; Maurette, P. (1998). "Description of local adaptation of national guidelines and of active feedback for rationalising preoperative screening in patients at low risk from anaesthetics in a French university hospital". Quality in Health Care : QHC. 7 (1): 5–11. doi:10.1136/qshc.7.1.5. PMC 2483578. PMID 10178152. ^ "The day of your surgery – adult: MedlinePlus Medical Encyclopedia". medlineplus.gov. Retrieved 24 January 2019. ^ Martin, Shirley (2007). Minor Surgical Procedures for Nurses and Allied Healthcare Professionals. England: John Wiley & Sons, Ltd. p. 122. ISBN 978-0-470-01990-0. ^ Wagman LD. "Principles of Surgical Oncology" Archived 15 May 2009 at the Wayback Machine in Pazdur R, Wagman LD, Camphausen KA, Hoskins WJ (Eds) Cancer Management: A Multidisciplinary Approach Archived 4 October 2013 at the Wayback Machine. 11 ed. 2008. ^ Doyle S.L. ; Lysaght J.; Reynolds J.V. (2010). "Obesity and post-operative complications in patients undergoing non-bariatric surgery". Obesity Reviews. 11 (12): 875–86. doi:10.1111/j.1467-789X.2009.00700.x. PMID 20025695. Sheth, V.M. ; Weitzul, S. (2008). "Postoperative topical antimicrobial use". Dermatitis : Contact, Atopic, Occupational, Drug. 19 (4): 181–89. PMID 18674453. ^ Heal, Clare F; Banks, Jennifer L; Lepper, Phoebe D; Kontopantelis, Evangelos; van Driel, Mieke L (2016). "Topical antibiotics for preventing surgical site infection in wounds healing by primary intention" (PDF). Cochrane Database of Systematic Reviews. 11: CD011426. doi:10.1002/14651858.cd011426.pub2. PMID 27819748. ^ Aylin P, Alexandrescu R, Jen MH, Mayer EK, Bottle A (2013). "Day of week of procedure and 30-day mortality for elective surgery: retrospective analysis of hospital episode statistics". BMJ. 346: f2424. doi:10.1136/bmj.f2424. PMC 3665889. PMID 23716356. ^ Yang, Michael M H; Hartley, Rebecca L; Leung, Alexander A; Ronksley, Paul E; Jetté, Nathalie; Casha, Steven; Riva-Cambrin, Jay (April 2019). "Preoperative predictors of poor acute postoperative pain control: a systematic review and meta-analysis". BMJ Open. 9 (4): e025091. doi:10.1136/bmjopen-2018-025091. ISSN 2044-6055. ^ Weiss AJ, Elixhauser A, Andrews RM (February 2014). "Characteristics of Operating Room Procedures in U.S. Hospitals, 2011". HCUP Statistical Brief No. 170. Rockville, MD: Agency for Healthcare Research and Quality. Archived from the original on 28 March 2014. ^ Weiss AJ, Elixhauser A (March 2014). "Trends in Operating Room Procedures in U.S. Hospitals, 2001–2011". HCUP Statistical Brief No. 171. Rockville, MD: Agency for Healthcare Research and Quality. Archived from the original on 28 March 2014. ^ Weiss AJ, Barrett ML, Steiner CA (July 2014). "Trends and Projections in Inpatient Hospital Costs and Utilization, 2003–2013". HCUP Statistical Brief No. 175. Rockville, MD: Agency for Healthcare Research and Quality. Archived from the original on 3 August 2014. ^ a b Moore B, Levit K, Elixhauser A (October 2014). "Costs for Hospital Stays in the United States, 2012". HCUP Statistical Brief No. 181. Rockville, MD: Agency for Healthcare Research and Quality. Archived from the original on 29 November 2014. ^ a b Makary MA, Segev DL, Pronovost PJ, et al. (June 2010). "Frailty as a predictor of surgical in older patients". J. Am. Coll. Surg. 210 (6): 901–08. doi:10.1016/j.jamcollsurg.2010.01.028. PMID 20510798. Lay summary (28 December 2010). ^ Meara JG, Leather AJ, Hagander L, Alkire BC, Alonso N (2015). "Global Surgery 2030: evidence and solutions for achieving health, welfare, and economic development". Lancet. 386 (9993): 569–624. doi:10.1016/S0140-6736(15)60160-X. PMID 25924834. ^ Bhangu, Aneel; Morton, Dion G.; Brocklehurst, Peter; Lilford, Richard; Garden, O. James; Yepez, Raul; Verjee, Azmina; Tabiri, Stephen; Sundar, Sudha (2 February 2019). "Global burden of postoperative death". The Lancet. 393 (10170): 401. doi:10.1016/S0140-6736(18)33139-8. ISSN 0140-6736. ^ GlobalSurg Collaborative (2016). "Mortality of emergency abdominal surgery in high-, middle- and low-income countries". British Journal of Surgery. 103 (8): 971–988. doi:10.1002/bjs.10151. PMID 27145169. ^ GlobalSurg Collaborative (2016). "Determinants of morbidity and mortality following emergency abdominal surgery in children in low-income and middle-income countries". BMJ Global Health. 1: e000091. doi:10.1136/bmjgh-2016-000091. PMC 5321375. PMID 28588977. ^ UN General Assembly. International Covenant on Economic, Social and Cultural Rights – United Nations Treaty Series. In: Nations U, editor. 1966. ^ 2. UN General Assembly. International Covenant on Economic, Social and Cultural Rights – United Nations Treaty Series. In: Nations U, editor. 1966. ^ a b UN Committee on Economic Social and Cultural Rights. CESCR General Comment No. 14: The Right to the Highest Attainable Standard of Health (Art. 12) 2000. ^ World Health Organization. Global Initiative for Emergency and Essential Surgical Care 2017 [cited 2017 October 23rd]. Available from: "WHO | WHO Global Initiative for Emergency and Essential Surgical Care". Archived from the original on 25 March 2012. Retrieved 9 February 2012. ^ Meara JG, Leather AJ, Hagander L, Alkire BC, Alonso N, Ameh EA, et al. Global Surgery 2030: evidence and solutions for achieving health, welfare, and economic development. International journal of obstetric anesthesia. 2015 April; 25:75–78. PubMed PMID 26597405. Epub 2015/11/26. eng. ^ Shiffman, Melvin (2012). Cosmetic Surgery: Art and Techniques. Springer. p. 20. ISBN 978-3-642-21837-8. ^ Sullivan R (1996). "The Identity and Work of the Ancient Egyptian Surgeon". Journal of the Royal Society of Medicine. 89 (8): 469. ^ James P. Allen, The Art of Medicine in Ancient Egypt. (New York: The Metropolitan Museum of Art, 2005) 72. ^ "Stone age man used dentist drill". BBC News. 6 April 2006. Archived from the original on 22 April 2009. Retrieved 24 May 2010. ^ Singh, P.B. ; Pravin S. Rana (2002). Banaras Region: A Spiritual and Cultural Guide. Varanasi: Indica Books. p. 31. ISBN 978-81-86569-24-5. ^ Zimmerman, Leo M.; Veith, Ilza (1993). Great Ideas in the History of Surgery. Norman Publishing. pp. 82–83. ISBN 978-0-930405-53-3. Retrieved 3 December 2012. ^ Pormann, Peter E. (2004). The Oriental Tradition of Paul of Aegina's Pragmateia. Brill. pp. 300–04. ISBN 978-90-04-13757-8. Retrieved 6 December 2012. ^ Aschoff, A.; Kremer, P.; Hashemi, B.; Kunze, S. (October 1999). "The scientific history of hydrocephalus and its treatment". Neurosurgical Review. 22 (2–3): 67–93, discussion 94–95. ISSN 0344-5607. PMID 10547004. ^ Sven Med Tidskr. (2007). "From barber to surgeon – the process of professionalization". Svensk Medicinhistorisk Tidskrift. 11 (1): 69–87. PMID 18548946. ^ Levine JM (March 1992). "Historical notes on pressure ulcers: the cure of Ambrose Paré". Decubitus. 5 (2): 23–24, 26. PMID 1558689. ^ Moore, Wendy (2005). The Knife Man: The Extraordinary Life and Times of John Hunter, Father of Modern Surgery. Crown Publishing Group. ISBN 978-0-7679-1652-3. Retrieved 7 February 2013. ^ "John Hunter: "the father of scientific surgery": Resources from the collection of the P.I. Nixon Library". Archived from the original on 26 October 2013. Retrieved 17 December 2012. ^ "John Hunter: 'Founder of Scientific Surgery'". Archived from the original on 14 December 2013. Retrieved 17 December 2012. ^ Gordon, H. Laing (2002). 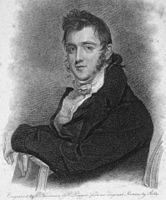 Sir James Young Simpson and Chloroform (1811–1870). The Minerva Group, Inc. p. 108. ISBN 978-1-4102-0291-8. Retrieved 11 November 2011. ^ Robinson, Victor (2005). The Story of Medicine. Kessinger Publishing. p. 420. ISBN 978-1-4191-5431-7. ^ Lister J (21 September 1867). "On the Antiseptic Principle in the Practice of Surgery". The British Medical Journal. 2 (351): 245–60. doi:10.1136/bmj.2.351.246. PMC 2310614. PMID 20744875. . Reprinted in Lister, BJ (2010). "The classic: On the antiseptic principle in the practice of surgery. 1867". Clinical Orthopaedics and Related Research. 468 (8): 2012–16. doi:10.1007/s11999-010-1320-x. PMC 2895849. PMID 20361283. ^ Lister, Joseph (December 2007). On the Antiseptic Principle of the Practice of Surgery by Baron Joseph Lister. Project Gutenberg. Archived from the original on 9 October 2011. Retrieved 2 September 2011. E-text, audio at Project Gutenberg.